Sait about flat EH antennas. Articles. Descriptions. Design. Experiments. Results of tests. I detail on this page construction data for a wide spectrum of flat EH antennas from 18 MHz to 28 MHz. I focus on a flat EH antenna for 27 MHz because this band of frequencies lie somewhere in the middle between 18 and 28 MHz. It is a fairly easy procedure to scale up or down in frequency for the 28 MHz or 18 MHz and I have had very positive results on these frequencies using the flat EH antenna design. 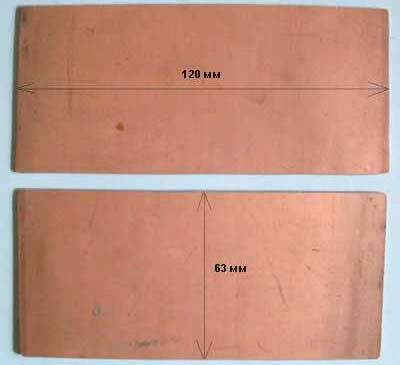 In this article will consider making of a few flat EH antennas. First flat EH antenna for 27 MHz band. 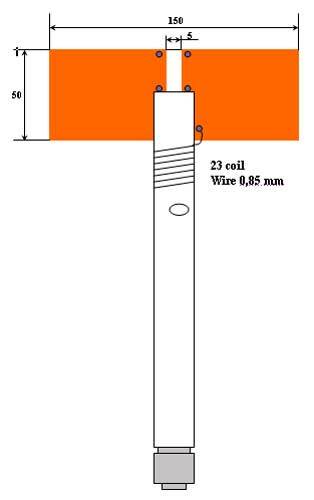 Please see Pic.1 below which gives you an idea of what a flat EH antenna looks like. This design of antenna is well suited for home and portable use. 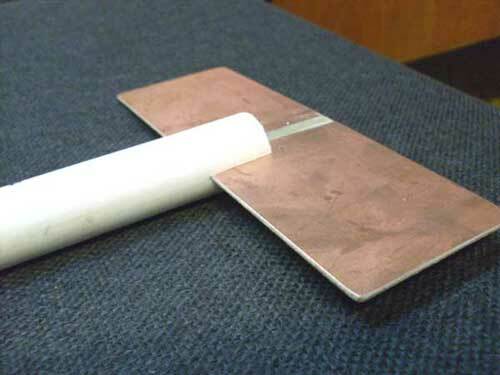 Pic.1 Flat EH antenna for 27 MHz band for portable use. 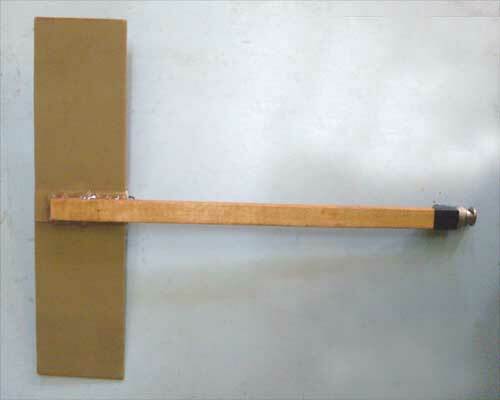 The antenna is fastened onto a wooden (or plastic) former to ensure that the operatorТs head/body does not influence any antenna parameters. The wooden former or lath can be made slightly longer or shorter and its length is not too critical. Pic.2,3 Two pieces of foils fiberglass. Cut a 20 mm strip of one edge of the plastic (see Pic above). Cut a piece of wood to a length of 250 mm. Glue the plastic onto the piece of wood using a glue gun Ц (see Pic.4 and Pic.4.5 below). Pic.4,5 We Two plastic strips glued to a piece of wood. You can also use just one piece of plastic (much neater) using sizes of 220 x 63 mm. But in this case it would be necessary to take off the foil near the central part so that it can be glued onto the wood. The next step is to build the tuning coil. Firstly, we need a piece of polypropylene waste or drain pipe with a diameter of 20 mm 40 mm long.We then wind 23 coils of wire diameter 0,85 mm onto the drain pipe former (see Pics below). 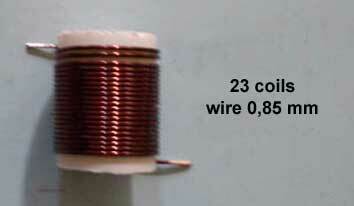 We then solder the top of the wire from the tuning coil to one side of the copper rectangular plate. 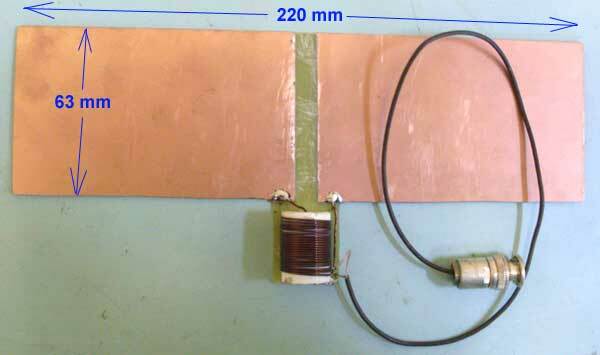 The base of the tuning coil wire is soldered to the other side of the antenna rectangular plate (see Pic.8). The next step is to connect a wire (the same wire diameter used for the tuning coil) from the middle of an SO239 or BNC chasis mount. This central wire from the antenna socket is СtappedТ onto the base of the tuning coil. From experience, you can tap this wire two turns up from the base of the tuning coil (see Pic above). 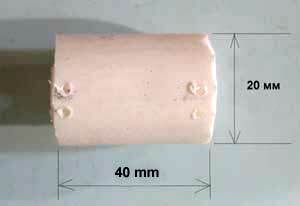 A ground wire from the SO239 or BNC chasis mount connector is attached directly to the base or Сcold endТ of the tuning coil. Please see my TUNING page on how to tune these antennas. 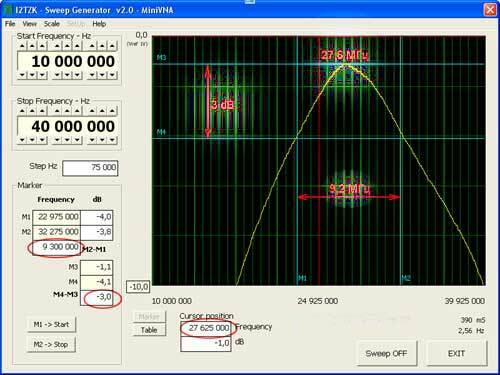 The screenshots below detail the important antenna parameters that must be satisfied in order to ensure a flat EH antenna functions efficiently; namely, resonance, 1:1 VSWR and maximum field strength at the mid-band of your chosen band. Pic.9,10 Descriptions and parameters of the antenna. 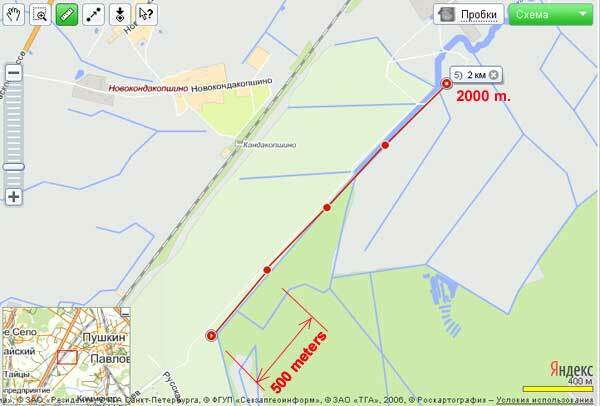 The screenshots show that at the mid-band frequency of 27,5 MHz. The <2:1 SWR passband is a pleasing 2,24 MHz wide. 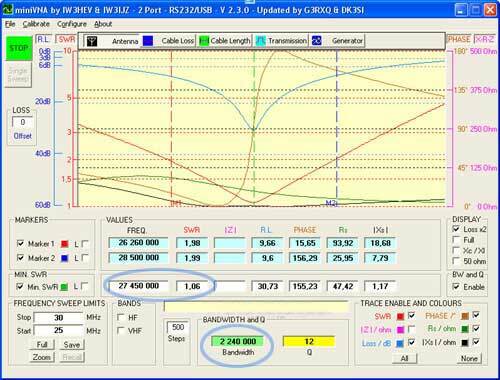 The SWR passband plus or minus 3 db is 9,2 MHz. 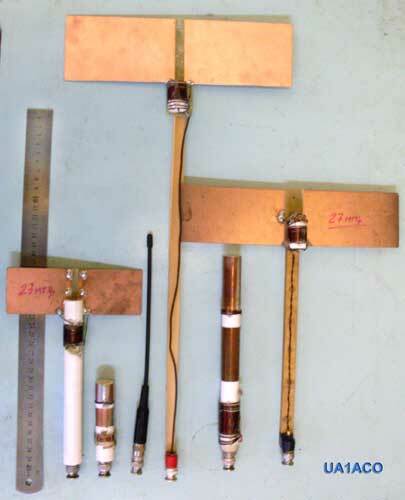 It is possible to construct other compact flat EH antennas using the above construction methods (see Pic.11). Pic.11 Flat EH antenna on 27 MHz, but other construction. 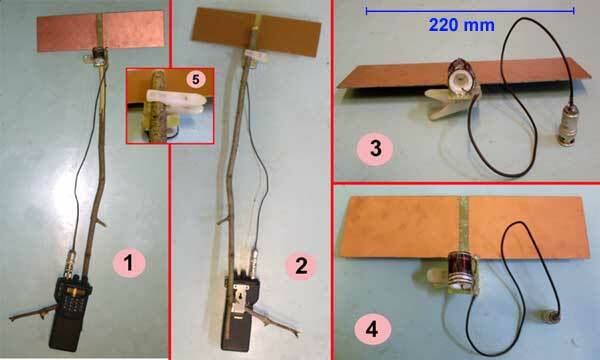 Pic.12 EH antenna supported on a handheld by a branch. 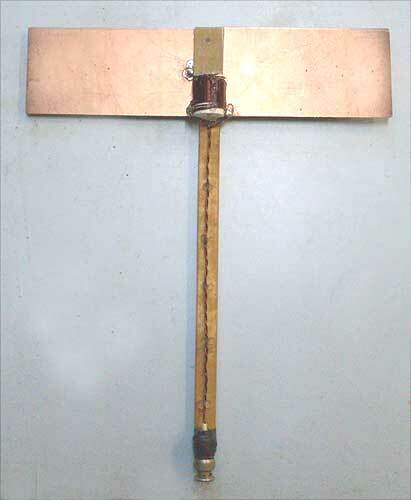 Second flat EH antenna 27 MHz band. Next antenna easier in making and reminds previous, but on parameters analogical. Pic.13,14 Flat EH antenna on 27 MHz also. The wire from the middle of a BNC socket BNC is RG-58 and СtapsТ two turns up from the base of the tuning coil (Pic.13). The construction of antenna is very simple and does not require any further explanation (see Pic.15). Pic.16 (below) illustrates the varied construction methods for building both flat and cylindrical EH antennas cut for the 27 MHz band. It is also constructive to note the relative sizes of all these antennas to the standard СrubberТ antenna (4th from the left). 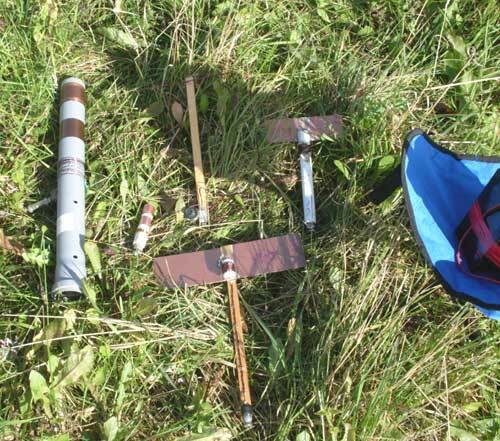 All of these antennas were tested in the field by comparison to a fullsize dipole using the same height above ground) and all flat and cylindrical antennas produced excellent results. It was found that practically, all EH antennas performed to the same level as a fullsize dipole which was 5,5 metres long. Pic.17 Map of test EH antennas. Pic.18 All EH antennas before the test. 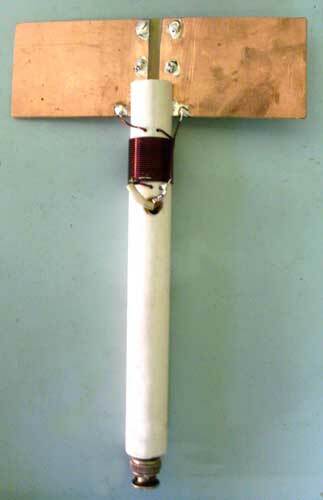 Pic.19 A classic fullsize dipole (5,5 meters long) 1.7 m above ground, the same height for all antennas under test. It is possible using the eh6.exe programme to derive antenna construction data to scale up or down the flat EH antenna for frequencies between 18 MHz Ц 29 MHz, they all work amazingly well. 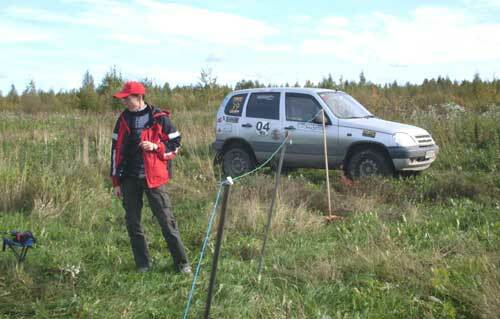 Incidentally, the photo below shows a typical mobile antenna and an EH antenna for mounting on a car. Clearly, the EH antenna appears the best one to use based purely on its size. In practice it is not so simple because whereas the standard antenna relies on the body of the vehicle as its Сmirror imageТ or ground, the EH does not require grounding in this way and in fact, performance of an EH antenna can be severely degraded. 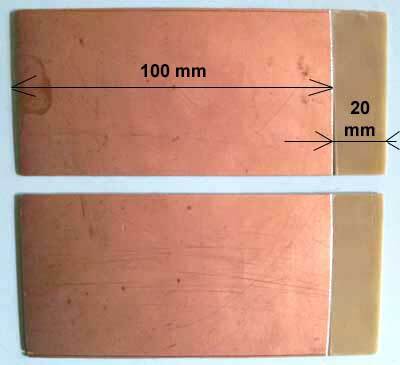 This in part is due to coupling between the relatively high magnetic fields generated by both flat and cylindrical EH antennas and the car body. 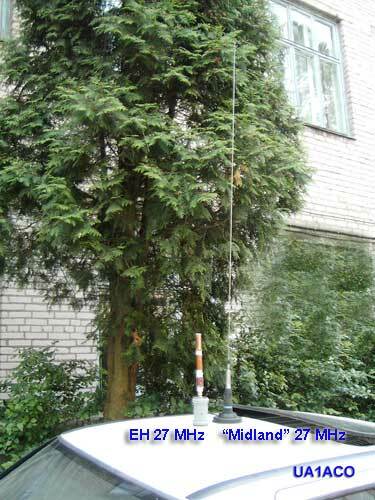 Pic.20 EH antenna on 27 MHz band and antenna "Midland" on the car "Ford".